So I know that it’s been over two months since I’ve posted on this little blog of mine, but I’m surprised that it generates some daily average of 300+ views. Thanks, everyone, and please continue with the comments and questions, etc. I check every now and again, even though life and work has gotten the best of me at the moment. You are probably all very sick of me blogging about the bullet journal, and I’m fairly certain that I’ve changed planners and formats more frequently this year than any other year! I came across Plannerisms’s ongoing debate a few days ago, and I can absolutely relate to her planner conflict! 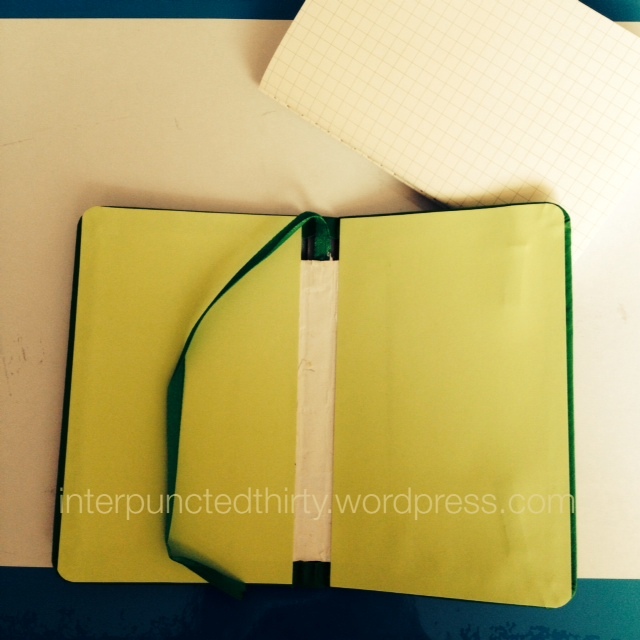 For me, I think having two separate planning systems has buggered me over. My work documents can potentially be subpoenaed and I have to surrend them to the company once my contract finishes this year. I’m not too keen on other people knowing about my personal life, and it just looks unprofessional. 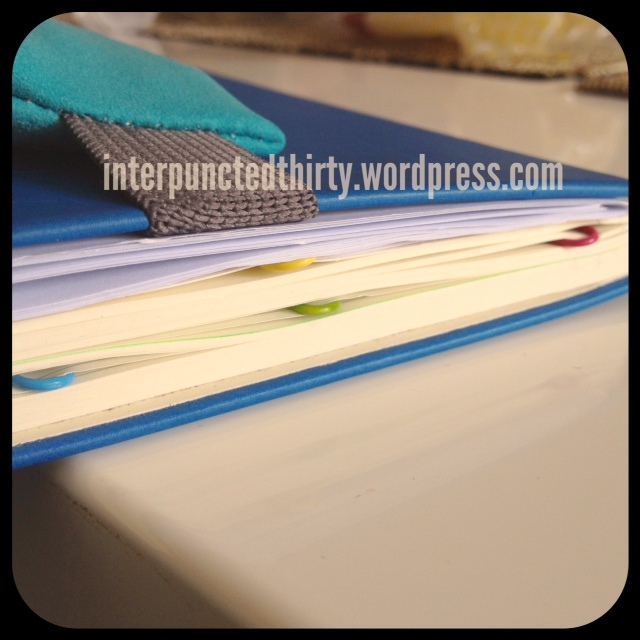 And yes, I know that I promised to post a blog up about my work bullet journal, but I’ve somehow lost that post somewhere in the abyss of my laptop desktop. I’ve got a bit of a break coming up, so I’ll try to get that up and running. So today’s treat is a peak into my personal weekly bullet journal. I know last post I mentioned that I went back to grid paper, used the TDW, etc., but now I’ve returned to my beloved Castelli weekly planner. This is my one book wonder! 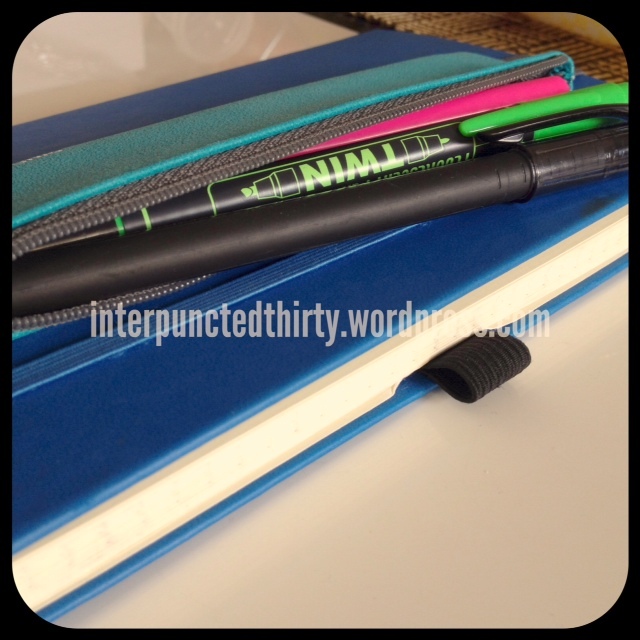 I bought the binder pouch on the outside from Daiso a few days ago and it holds my trusty Uni Jetstream 101 black pen, and two different coloured highlighters. The Castelli weekly planner is formatted in a similar fashion to the Moleskine and Leuchtturm1917 weekly planners but it comes in a 15 month book, with lots of useful information at the front. I discovered today that it has an information page dedicated to the meanings of Latin terms. Yes, I know, it’s the speech-language pathologist side coming out in me! Anyhoo, below is a sample page. Excuse the white marks, I needed to deidentify a few bits of it. I write all my events and appointments on the weekly side (left page) using this format: time event @ location, e.g. “1830 dinner @ friends place”. Below is a close up of some of the tasks. 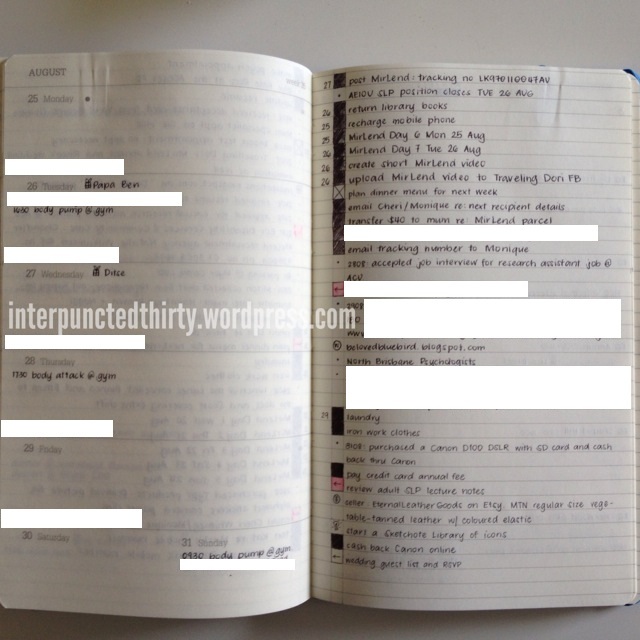 I use the ‘tasks‘ bullet (square) with the in progress/incomplete and complete annotations as my original post from many months ago but I don’t use the GTD ‘@contexts’ anymore. I list all the tasks that need to be finished (attempted) that week. So, call this a ‘brain dump’, if you will. I don’t have a set time to plan, but I guess it’s usually somewhere between finishing off reports at home and sleeping, that I decide to allocate a task to a given day. This is what the numbers to the left of the task boxes signify. If I know something needs to be completed on a day, then I’ll write that in. When I look over my planner for the day, I scan the left side of the margin to any numbers that coincide with today. For example, if the day is August 25, then I scan down the left side of the margin, until I see ’25’, and I see that I need to ‘recharge my mobile phone’ and ‘MirLend Day 6’ journal entry. Migrated tasks have the arrow and then a date assigned to it. 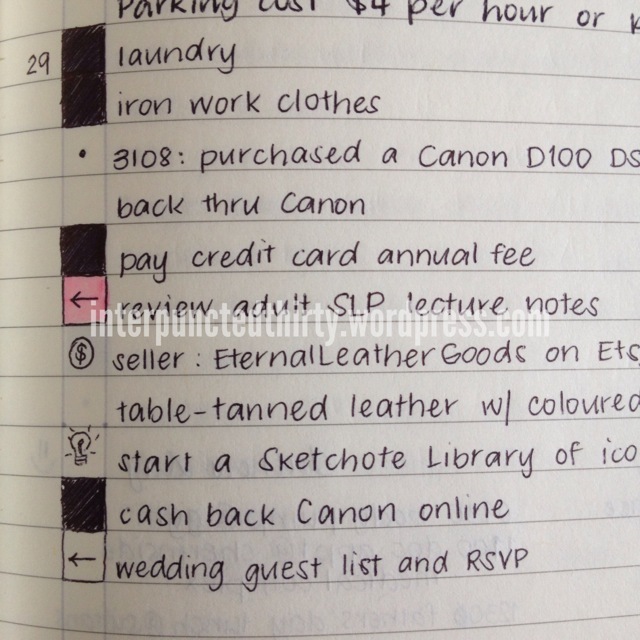 If I don’t have a date for it, I highlight it pink for when I do a monthly task scan – it stands out more this way. I also have different icons to signify ideas, books, sellers, websites, etc. The one thing that the Castelli planner doesn’t have is a ribbon to mark your place in the year. I had some coloured paperclips from a previous stationery haul, so I decided to use them as bookmarks. The yellow marks the yearly calendar, the green is the start of my collections, the blue is my current place in the planner, and the pink is a spare. 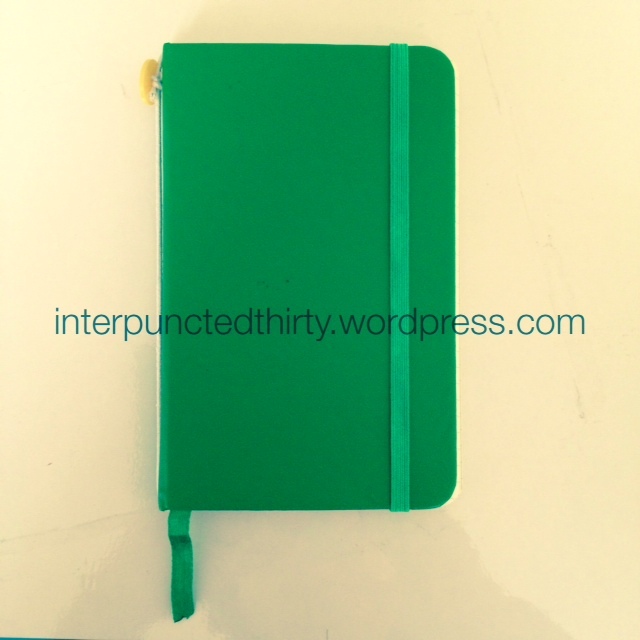 I’ve been (re-using) this planner for about 5 weeks now, and so far so good. 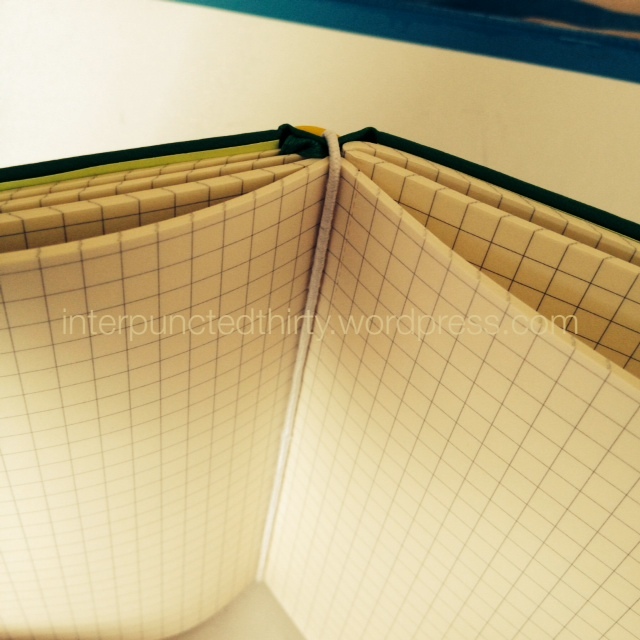 So, internet community, what are some planner modifications you’ve made since you last visited my blog? 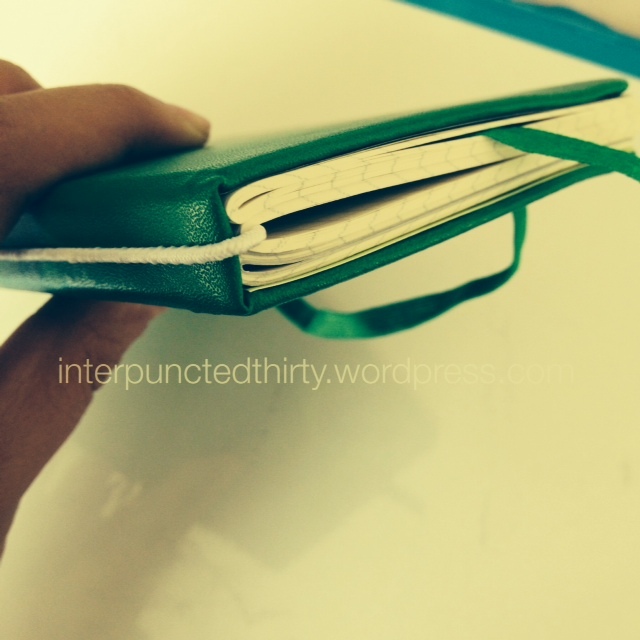 Have you ditched your current planning/organising system? If so, what was the clincher? 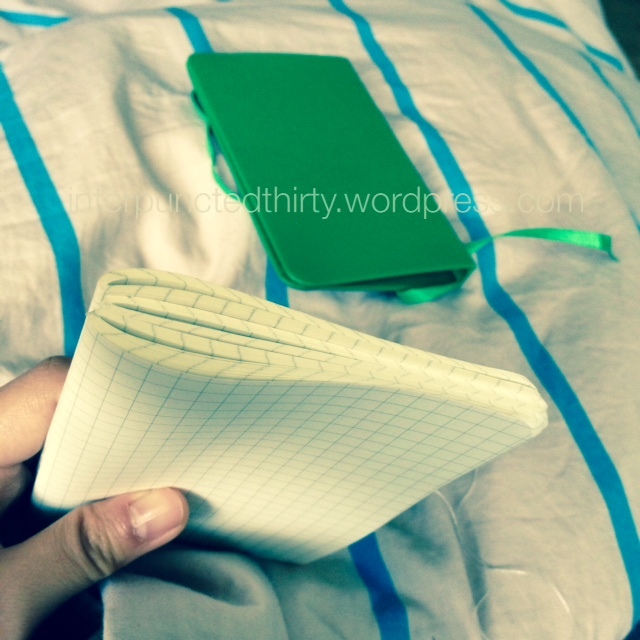 I’m downsizing my bullet journal. Well, my Piccadilly bullet journal fell apart completely a fortnight ago, so much so that I couldn’t even salvage the hardbound cover. Yes, it has a pretty rough time in my everyday bag, and I’ve been using it more lately to scribble and draw during my very rare lunch breaks at work. Then I finally gave up when I knocked over some PVA glue during a resource-making activity and did my best to save what I’d written, but the pages are now stuck together. So, it’s sorta just been acting like a paperweight on my desk. 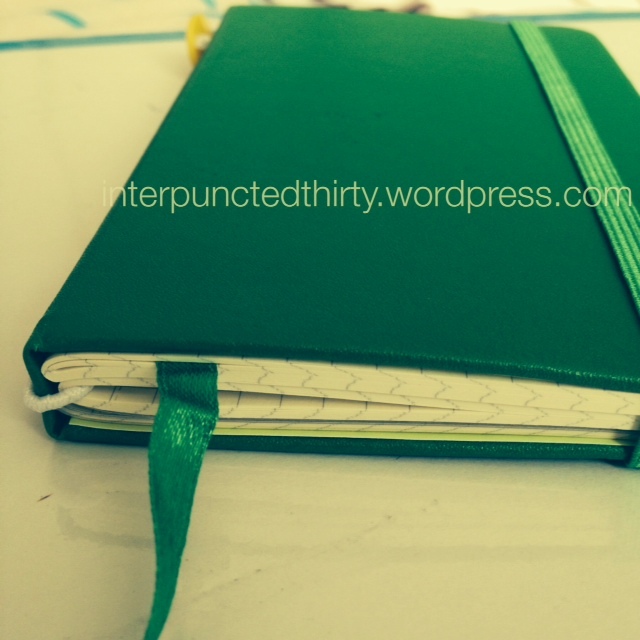 And, I haven’t been bullet journalling for a fortnight either. It’s a weird feeling, almost akin to a strange sense of grief. Hah. 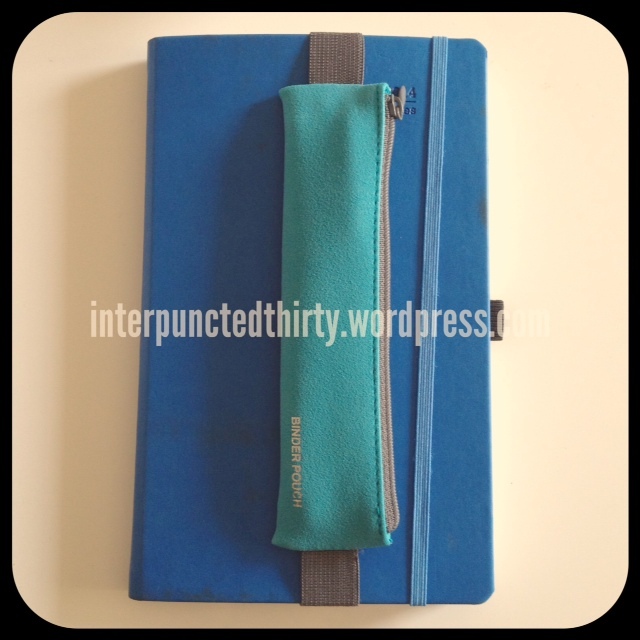 That aside, I decided to rummage through my multiple boxes of hoarded stationery at home, and came up with some up-cycling ideas. I had forgotten that I’d bought some stupid amount of Moleskine stationery four years ago when it was on sale on Amazon. Money has been a massive issue this year so far, so I thought that instead of going out there and buying more stuff, I’d make something with what I already have. I haven’t used any of these notebooks before, so I’m now going to start using them. This is what I made today. 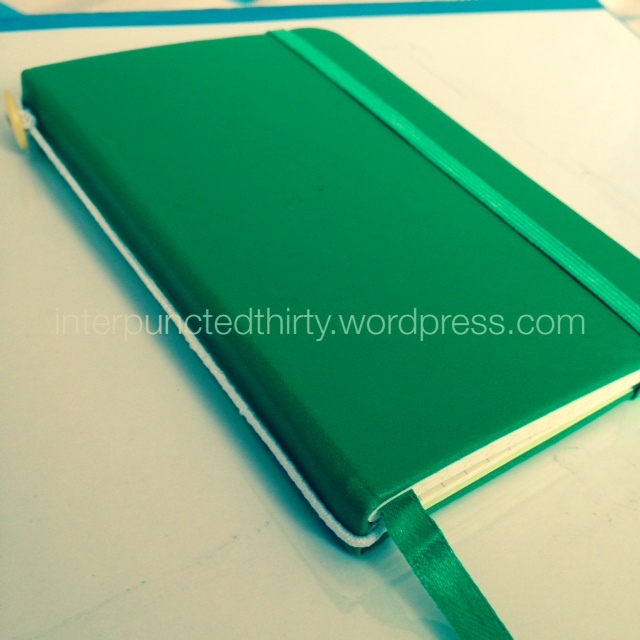 This is basically three pocket Moleskine cahiers bound together and inserted into a Piccadilly hardbound cover. If you want to know what I do with the notebook part of the Piccadilly books, I’ve kept them in ziplock bags and stored them away. At the end of the day, it’s what’s written on those pages that matter more than the cover itself. 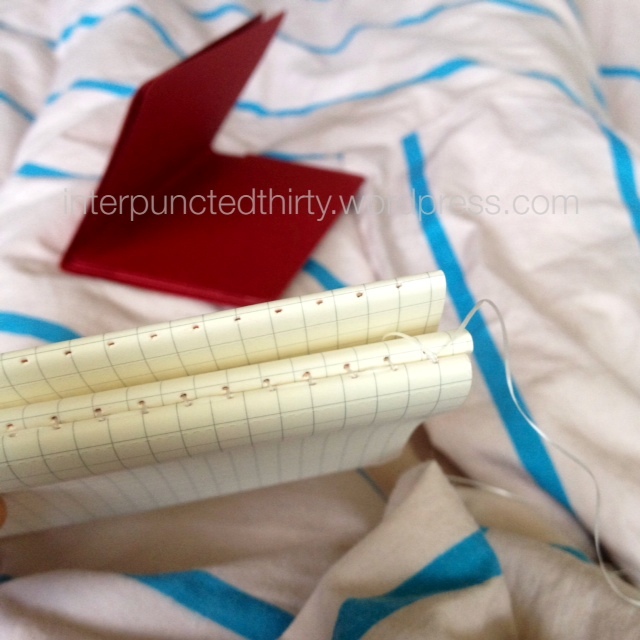 I started off by removing the cardboard covers from the Moleskine cahiers and using a coptic stitch to bind them together. (Google “coptic stitch” and there are thousands of tutorials on it). I use floss instead of waxed cotton, and it’s the cheap floss, too – does the same job. This is how it looks like after it’s finished. I tore out the inside pages in the Piccadilly hardbound cover and tried my hardest to leave the ribbon marker and elastic closure in place. I had some spare scrapbooking paper lying around, so I cut out two pages to cover the messiness of the inside cover. After this, I contemplated for awhile. 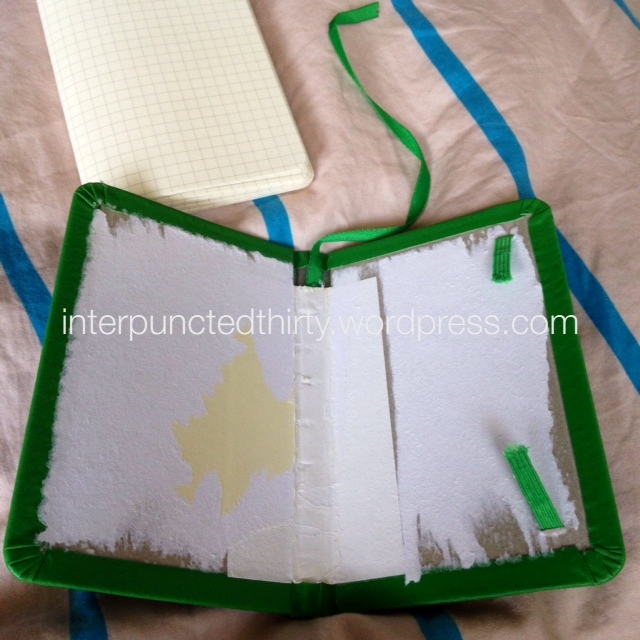 I was of two minds about attaching the bound cahiers to the cover because it just meant that I wouldn’t be able to use the cover again, and I’d be compelled to buy another notebook. So, I appropriated the idea of the MTN and decided to use a piece of tube elastic wrapped around the spine of the cover. 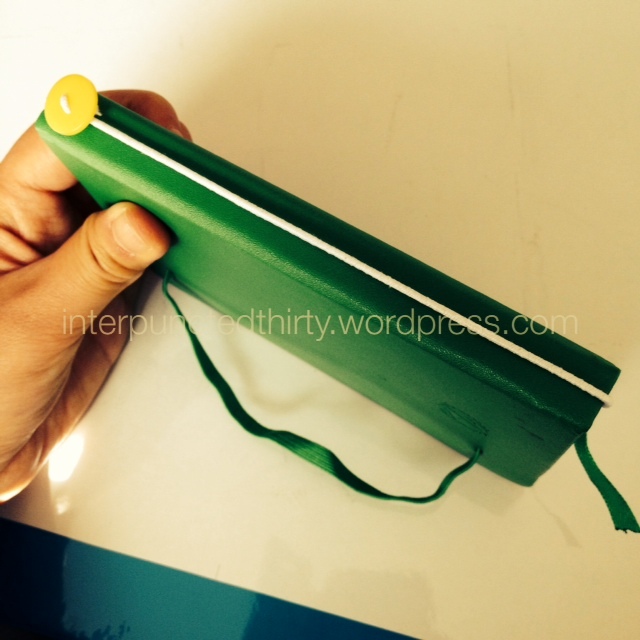 I fed the bound cahiers through the elastic to secure it in place. Then after this, I thought, “Hell yeah, let’s do something f@#%ing wild, and embellish this!” I found some yellow buttons I’d purchased from a bargain bin at Spotlight whilst shopping with a friend. I fed the elastic through the button holes and tied a knot underneath to secure. Et voila! New bullet journal for me to trial from today :) These are a few more pics from different angles.